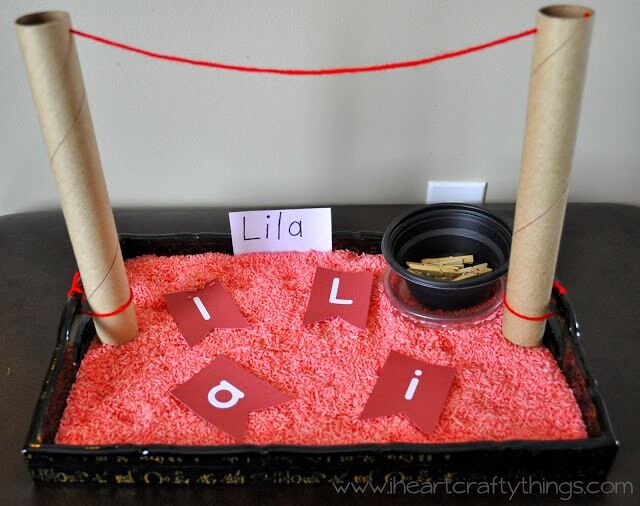 One of my new goals for 2014 with homeschooling my 3-year old is to incorporate activity trays into our learning. My daughter works really well with this type of learning environment so I’m excited to see her progress as we use them this year. I made three trays last week that she enjoyed that incorporated fine motor, numbers, counting, sorting and name recognition using a Valentine’s Day theme. 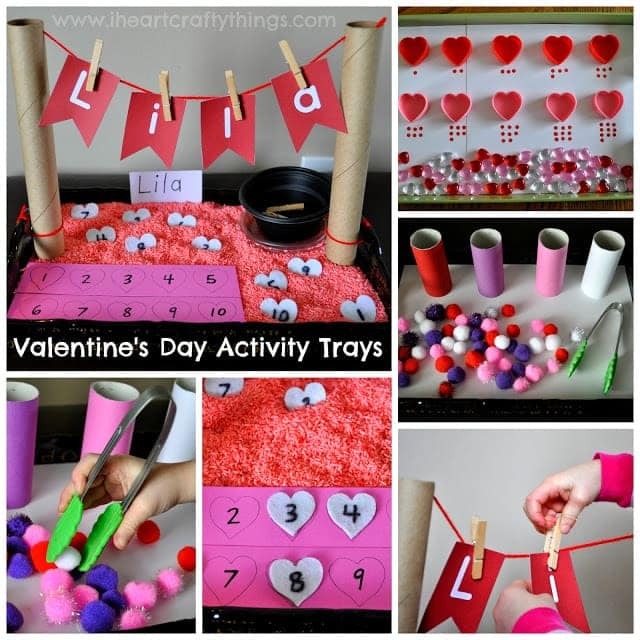 The first tray is all about counting. My daughter can count out loud herself but she struggles pointing to objects and counting them in order from 1-10. I wanted to make a tray to help her practice. I purchased the plastic heart containers from the Target dollar section last year. 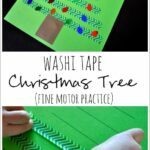 I saw similar ones at both Dollar Tree and Michael’s recently. I set the lids aside and taped the containers down onto to the tray (which was lined with white cardstock paper). 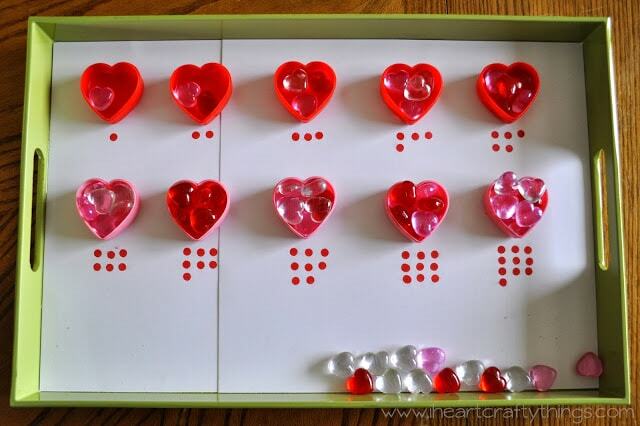 Then I got out a red stamp pad and stamped the dots under the hearts with a pencil eraser from 1 to 10. I purchased the heart gems from Micheal’s to put at the bottom of the tray (2 packages). 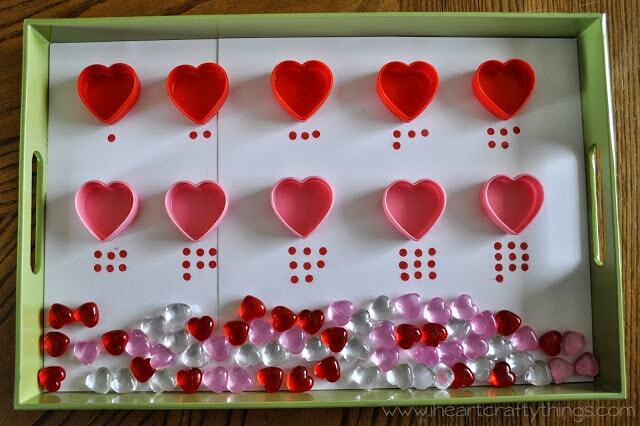 My daughter used her finger to count the dots under the hearts and then counted that many heart gems into the hearts. After a couple days we did have some progress, but you will probably see lots of these activities coming from me over the next couple months as I work on this with my daughter. 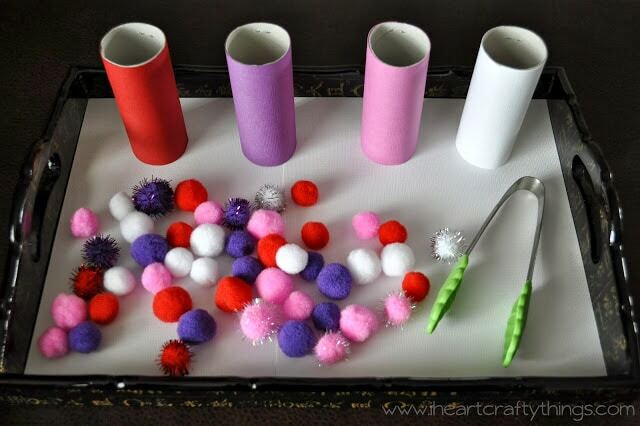 I saw this idea on Pinterest from The Princess and the Tot, color sorting with toilet paper rolls. 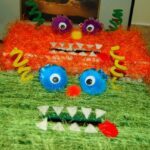 I used a package of Valentine’s Day pom-poms from the Target dollar section. This one never seemed to get old with my daughter. Not only did she love to fill the toilet paper rolls but she loved to lift them up and see them all fall out. The Princess and the Tot wrote the name colors on all the tubes which I forgot to do, but that would have definitely been a great touch! which you can purchase on Amazon. 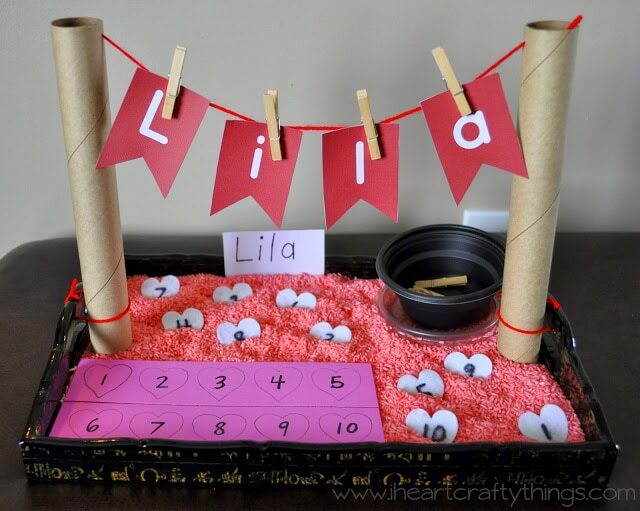 Our last activity tray ended up being 2 activities in one, number matching and name recognition practice. To make the clothesline, I started by taping down a piece of cardboard to the bottom of the tray really good. 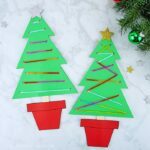 I didn’t have any empty paper towel tubes on hand but I had an empty wrapping paper roll so I cut it in half. It was thicker than regular paper towel tubes so they had a bit of weight to them. I cut slits in the bottom of the rolls, folded them out and then taped them down with clear packing tape to hold them in place. You can also see I tied a string around them at the bottom and secured them to the sides of the tray as well. Then I poked a small hole in them for the red yarn and made a double knot to hold it in place. 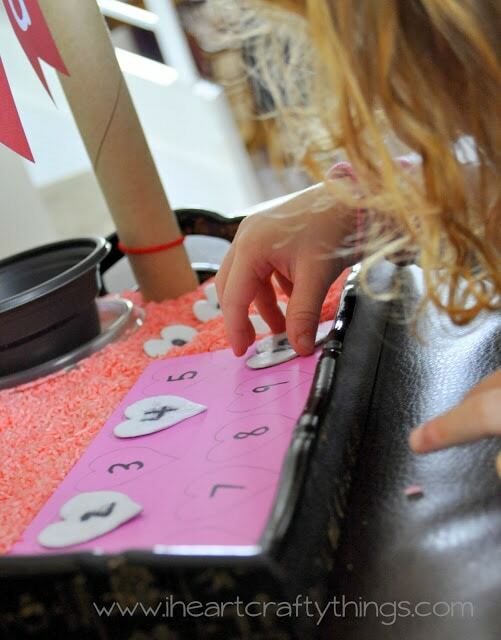 I dyed some rice pink and laid it in the bottom of the tray and wrote numbers 1-10 on ten white felt heart stickers. I traced the felt heart stickers on 2 strips of pink paper and then numbered the strips 1-10. I placed the hearts all over in the rice for my daughter to find. My daughter found a heart and had to match it to the correct number on the strips. After matching all the numbers we also practiced pointing and counting from 1 to 10. For the name recognition, I made the bunting letters on Picmonkey, about 2 inches wide and printed and cut them out. 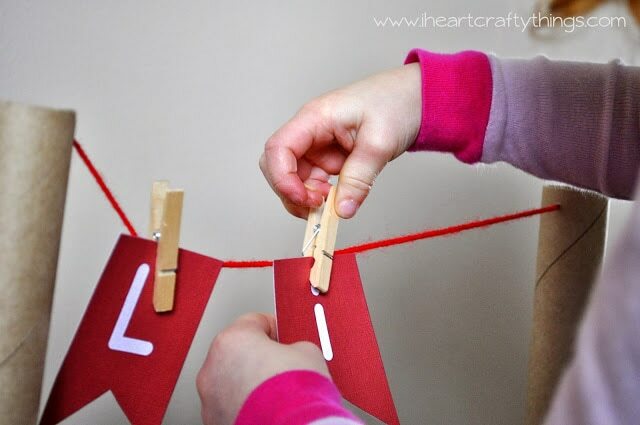 My daughter had to look at her name card at the back of the tray and use the clothespins to hang her name on the line in the correct order. The clothespins we used were a medium sized clothespin, not a regular-sized clothespin. 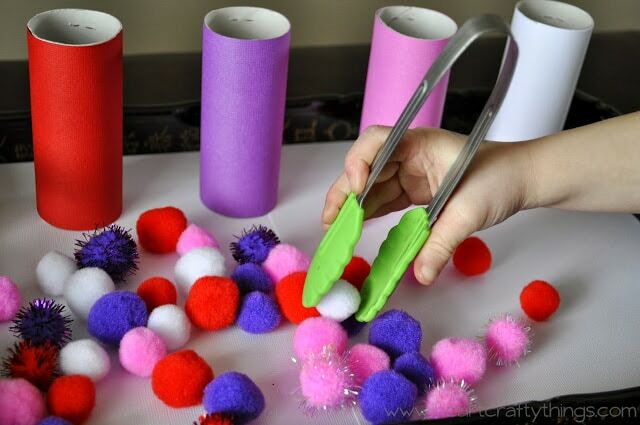 This activity was awesome for fine motor! We used the opportunity to talk about the letters in her name and to practice spelling her name out loud as well. My goodness you are working overtime just cranking out cool activities! Love these! What a great mom! 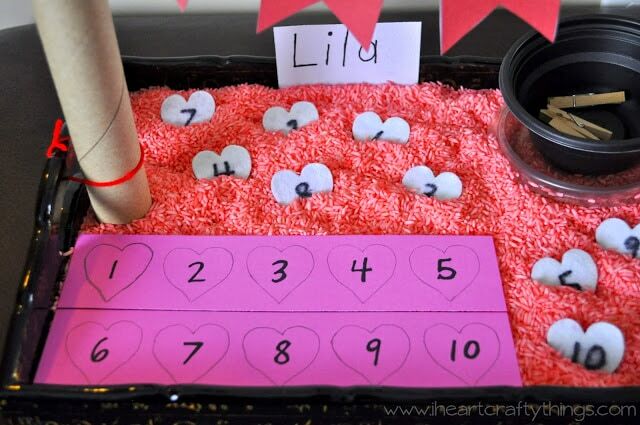 I love the rice sensory bin with the heart matching! I am definitely going to do that with our tot!